Need to just sent a quick gift to tell someone you’re thinking about them? How about eos’ new Organic Lip Balm – Holiday Collection? It’s three full-size spheres in Sweet Mint, Honeysuckle Honeydew and Pomegranate Raspberry. Yes these have their looks going for them but they're also good for lips as each is packed with the Shea Butter, vitamin E and jojoba oil. $9.99 @ ulta.com. We were just quoted in the latest issue of Women's World (January 25, 2010 issue) on a feature about lip balms. Of course we picked the ones from Evolution of Smooth (EOS). See below! Evolution of Smooth and ChapStick Sooth Lips Nicely! Now check out the shape of this new lip balm! I’m so in! EVOLUTION OF SMOOTH is definitely onto something with these Lip Balm Smooth Spheres ($3.29 @ kohls.com) – a bubble of lip moisturizing goodness! Each is infused with vitamin E, Shea butter and jojoba and comes in five flavors: Honeysuckle Honeydew, Summer Fruit, Pomegranate Raspberry, Vanilla Beach and Sweet Mint. Is a stick more up your alley? CHAPSTICK just came out with True Shimmer ($2.99 @walgreens.com). So how do these differ from the regular ChapStick you know and love? These go on smoother and add a little shine to your lips. Available in 4 summery flavors: Tropical, Peppermint Rush, Blended Fruit Sherbet and Botanical Berry. I love a gourmet shaving cream. There are not many out there so when I do come across one, it’s a must try. The latest one on the market? 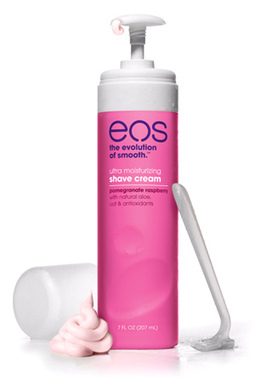 EVOLUTION OF SMOOTH or EOS Ultra Moisturizing Shave Cream ($5.49/7oz @ ulta.com) and this one does double duty -- shaves and moisturizes. And I like that you don’t have to wet your legs before putting it on as it doesn’t lather. It’s a cream and contains aloe, shea butter, and antioxidant vitamins. And how happening is the container? It’s easy to grab and hold onto and is recyclable so toss it in the blue bin when you’re finished. Available in three scents: Pomegranate Raspberry, Island Blue and Vanilla Bliss.